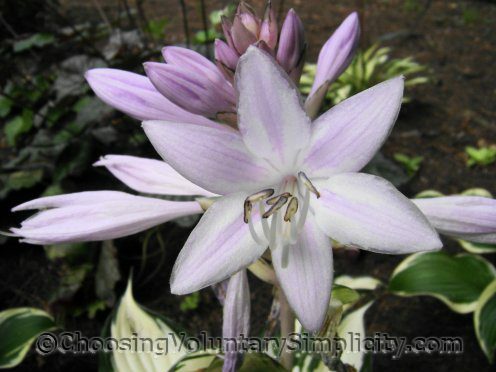 What Do Hosta Flowers Look Like? 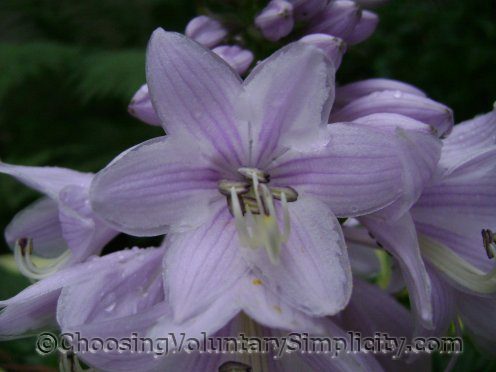 Home » Growing Hostas / Reader Questions » What Do Hosta Flowers Look Like? Reader question… “I am very interested in growing hostas from seeds and I found your posts about this very interesting. I see from your photos what the seed pods look like but where on the hosta are the seed pods located? Also do you have a photo of a hosta flower? Are the flowers or seed pods so small I might miss them? 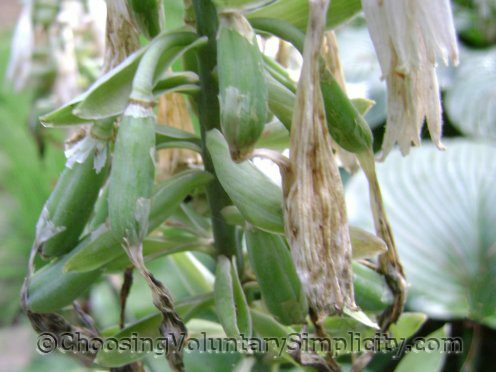 I have three hostas but I have never seen flowers or seed pods on any of them.” –Jarod R.
Your hostas may not be flowering for a variety of reasons. Sometimes it’s the weather… too cold temperatures, a late frost, too much rain, or not enough. Perhaps they haven’t yet produced a large enough root mass to support flowers… and especially if your hostas are newly transplanted they may need extra time to establish an adequate root system. Or perhaps they need a sunnier or shadier location or better drainage. If your hostas aren’t flowering but seem to be otherwise thriving I would guess that they just need more time or better weather conditions and that they will eventually begin to produce flowers. There are hostas that will flower but not form any seed pods, but most healthy and happy hostas will produce many scapes and dozens and dozens of flowers once they have become well established… and some but not all of these flowers will eventually become seed pods. Hosta flowers form on long scapes that usually tower above the hosta mound. The flowers hang down from the scapes, are bell or funnel shaped and look like small lilies. 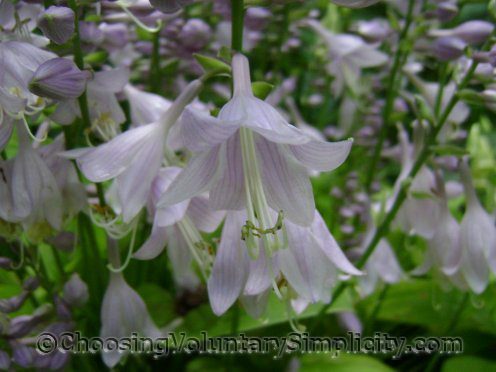 Some hostas produce white flowers… others produce flowers in shades of purple and lavender. Some have darker purple stripes. 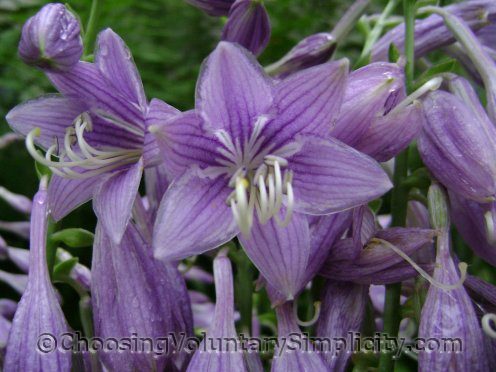 Most hosta flowers are small… up to two inches long… open early in the morning and have no scent. 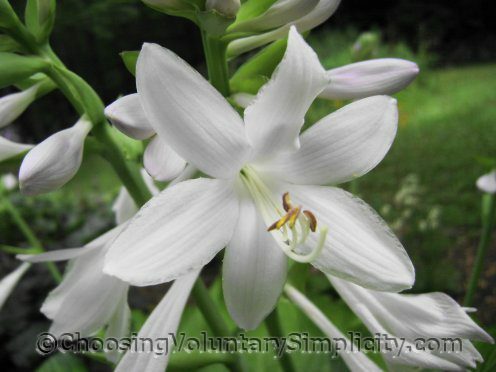 An exception is the old hosta species called Hosta plantaginea that has strongly scented white flowers. These flowers are larger… up to six inches long… and they don’t open until around four in the afternoon. Some people describe the scent of these flowers as being like honeysuckle, but to me the scent is very much like the sweetly fragrant wild New England mayflowers. There are also many hosta hybrids that produce fragrant flowers… H. ‘Guacamole’ is a hybrid I especially like because it also has the mayflower scented flowers. You can usually see the seed pods starting to form at the base of the flowers as the flowers fade. Eventually the withered flowers fall away and the seed pods are exposed. They will continue to grow longer and fatter as the season progresses, but seed pods can vary greatly in size and color. Some seed pods are almost white. Some hostas, like H. ‘Revolution,’ produce large striped seed pods. Others, like H. ‘Golden Tiara,’ produce seed pods that are very small and a darker green. This hosta is unique because it will sometimes blossom twice if you remove the flower scapes once the first flowers fade. The seed pods must mature before the seeds inside will be viable. In warmer climates the seed pods will have enough time to mature on the scapes. Here, with our cooler climate and very short summers, the seed pods never reach that point. I have found, however, that as long as the seeds inside the pod are black and have a definite bump on one end, they are probably worth harvesting. I wait to collect the seed pods until the night of the first frost. I store the pods in white paper envelopes, and after a few months the pods are dry and will open and the seeds can easily be removed. Why Mark Shields Never Looked So Good! Seriously… Doesn’t That Look Like a Smile? I know what hosta flowers look like but sadly rarely get to see them in my garden due to the gargantuan appetites of our snails and slugs. I go out every evening and collect them, I have tried every trick I have ever read but then I turn my back for a millisecond and my hostas and solomon’s seals have been turned to stalks. I have the same problem as the previous commenter. I have tried all the natural solutions for eliminating slugs but my hostas are a mess. I don’t want to use poisons. Shirley, would you consider a post about how you deal with this problem? Your hostas look so beautiful you must have found a solution. I especially appreciate your posts like this one that show what the flowers and seed pods of the plants look like. I’m a newbie gardener and I am learning so much from your blog. I’m hoping you will do a post on poppies maybe? I never realized hosta flowers are so beautiful. I have always cut the stems off before the flowers form. You can bet I won’t be doing that this year! Very interesting post as always. Love your work.